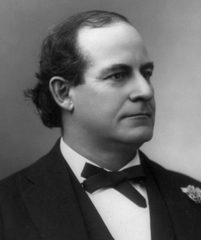 In a so far successful effort to avoid having to unpack a bunch of boxes that are cluttering my office at the moment, I’m talking about four scientists cited in a footnote in William Jennings Bryan’s In His Image (1922), evidently to support Bryan’s assertion, “If Darwin had described his doctrine as a guess instead of calling it an hypothesis, it would not have lived a year.” They are Robert Etheridge, Albert Fleischmann, and William Bateson, discussed in part 1, and Lionel S. Beale, discussed in part 2. In the preceding posts, I offered sporadic criticism of Bryan for his handling of these scientists, but here I’m going to adopt a systematic approach, listing seven desiderata—accuracy, provenance, currency, venue, expertise, relevance, and representativeness—for judging such citations of scientists, and assessing how well Bryan fares when judged accordingly. Accuracy. Are the citations accurate? In particular, are the scientists properly quoted? If not, are the inaccuracies harmless? Bryan’s quotation of Etheridge is not verbatim, and there’s reason to believe that it didn’t reflect Etheridge’s sentiments (as I suggested in part 4 of “Dr. Etheridge, Fossilologist”). His quotations of Fleischmann and Beale are not accurate, but they seem to reflect Fleischmann’s and Beale’s sentiments accurately. His paraphrase of Bateson is accurate. For accuracy, I assign Bryan 6.5 points out of 10. Provenance. Is enough information provided about the citations to allow the reader to locate the passage in question? In three of the four citations, Bryan fails to provide the first name of the scientist, the title of the article or book in which the quotation is to be found, and the year of the publication. These data are provided only for the most recent citation, from Bateson. Of course, a lecture is not the place for bibliographical rigor, but in preparing the lecture for publication it would not have been arduous for Bryan to supply the missing information. Except for the fact that, at least for the Etheridge quotation, he couldn’t have had it! For provenance, I assign Bryan 5 points out of 10. Currency. How recent are the citations? Bryan’s citations are from 1885 (Etheridge), 1903 (Fleischmann), 1921 (Bateson), and 1903 (Beale), so the average age is 18 years. Only the Bateson citation can be plausibly claimed to reflect a current scientific opinion, although it’s true that Fleischmann, at least, continued to produce antievolution literature, e.g., “The Doctrine of Organic Evolution in the Light of Modern Research,” published in the Journal of the Transactions of the Victoria Institute in 1933. For currency, I assign Bryan 5 points out of 10. Venue. Are the cited scientists addressing a scientific audience, where the standards of evidence are (or at any rate are supposed to be) higher? Bryan’s citations are to a private conversation (Etheridge), a book (Fleischmann), a lecture to a scientific society (Bateson), and a lecture to a religious society with a bias against evolution, the Victoria Institute (Beale). These vary in value, but none is from a venue with a level of rigor comparable to today’s peer-reviewed scientific research literature. For venue, I assign Bryan 5.5 points out of 10. Expertise. Are the cited scientists experts in relevant fields? Etheridge was a reputable paleontologist, although not one who published professionally on evolutionary topics; Fleischmann was a reputable developmental biologist; Beale was a reputable physiologist and anatomist, although not one who published professionally on evolutionary topics; Bateson was a leading geneticist. For expertise, I assign Bryan 9 points out of 10. Relevance. Do the citations establish what they are intended to establish? Here I’m not interested so much in whether the scientists cited by Bryan agree that “hypothesis” is synonymous with “guess” as in whether they agree that Darwin’s hypothesis—“the hypothesis that links man to the lower forms of life and makes him a lineal descendant of the brute,” as Bryan describes it—is no better than a guess. For Etheridge, Fleischmann, and Beale, Bryan’s citations seem fair. Bateson, however, was expressing agnosticism “as to the actual mode and processes of evolution,” not about evolution itself: “Our doubts are not as to the reality or truth of evolution, but as to the origin of species, a technical, almost domestic problem” (emphasis in original). For relevance, I assign Bryan 8 points out of 10. Representativeness. Are the cited scientists representative of the scientific consensus, if they are portrayed as such? If Bryan had claimed that the four scientists he cited represented a minority position, perhaps a viciously persecuted or unjustly ignored position, in the scientific community, then there would be no cause for complaint here. But by citing them as scientific authorities without any such proviso, he presents them as representative of the scientific consensus, which, clearly, they were not. In the same year that In His Image was published, for example, the American Association for the Advancement of Science issued a statement supporting the teaching of evolution; even if it appeared too late for Bryan to take account of it, he could not have been ignorant of the scientific consensus. (Bryan joined the AAAS in late 1924, by the way, although it’s not clear why; James Gilbert speculates, in his Redeeming Culture , “Perhaps he joined the AAAS as a public gesture, designed to advertise his position or maybe as a defiant declaration of principle: from a saint in a laboratory coat.”) So abjectly unrepresentative are these scientists that, for representativeness, I assign Bryan 0 points out of 10. Without weighting the categories, Bryan’s grade for his use of these four citations is a failing grade, 5.6 out of 10. I would be inclined to weight accuracy and provenance a little less, and weight expertise and relevance a little more, than the other categories, which might kick the grade up a little, but still not into the passing zone. In any case, here’s a table showing the component grades I assigned.